Help St. Michaels Stand Up Against Substance Abuse! To show support for the Talbot Goes Purple awareness effort sponsored by the Sheriff's Office and Tidewater Rotary, the Town of St. Michaels will string purple lights on the trees on Talbot Street. Visit our website for an updated list of events and participation throughout the town. You can participate! 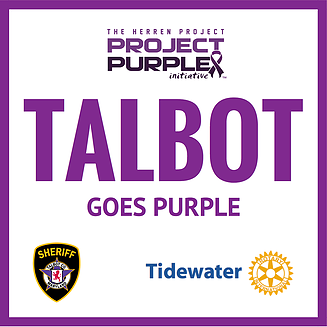 Sponsor a Purple Light Bulb to be hung on Talbot Street from September 9 to September 30. You can request a personal message up to 30 letters or just a name. Choose as many light bulbs as you wish for a cost of $50 each. Download an application HERE!